Why are local eggs better? Let’s take a look, shall we? What is the difference between these two eggs? Anyone? Ok yeah, the colors. Also the size and shape. These are things that you can see in the picture. The things that you can’t necessarily see in the picture are the more disturbing things. The egg on the left’s shell is thin and brittle. 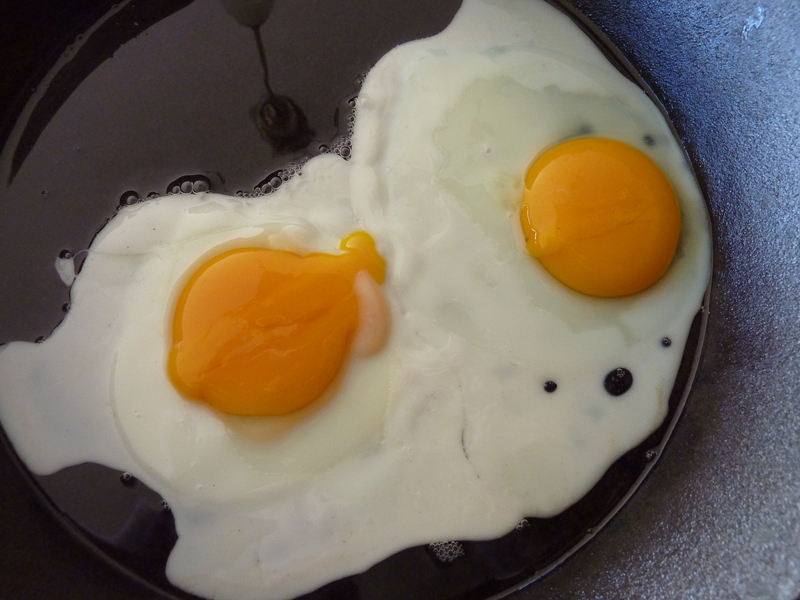 The egg on the left’s yolk also contains more cholesterol, because it was from an unhealthy chicken who was fed things that she was not supposed to eat. She also didn’t get any exercise. This chicken was probably contained in a cage that she could not even turn around in. EVEN if the package says “free-range”, the United States’ standard for free-range ain’t all it’s cracked up to be. For instance, the U.S’s free-range policy states that the chickens must have been allowed access to the outside. What does this mean? As one of my favorite journalists Michael Pollan says, it means that for the last two weeks of their life, the chickens are allowed access to a little door on the side of a giant barn that houses thousands of chickens restricted to tiny cages. This door is opened for the last two weeks of their life, and the chickens are allowed outside (outside meaning a tiny fenced-in area that has a dirt ground). Problem is, by that point, the chickens have lived their whole life in a tiny cage in a dark barn. They probably know their life is bad, but they have no idea what is on the other side of that door and they aren’t particularly eager to find out. “Cage-free” eggs also tend to be another marketing scam. Most of the time this means that the chickens live in severely confined spaces where they are more prone to disease due to being on the ground and in contact their own feces and other chickens, who are probably sick too. This is sad, right? This egg could have been purchased at any supermarket in America. So what about the egg on the right? The egg on the right’s shell is firm and hard to crack. The chicken (who I saw) lived a life outside on the ground, pecking away at grass and bugs. This chicken was occasionally chased by a walking 18-month-old or a small dog. She lived her life with other chickens and was lovingly put in a safe, comfortable barn every evening to protect her from foxes and raccoons. She did not eat genetically modified food. She was not sick. She was never in a cage. 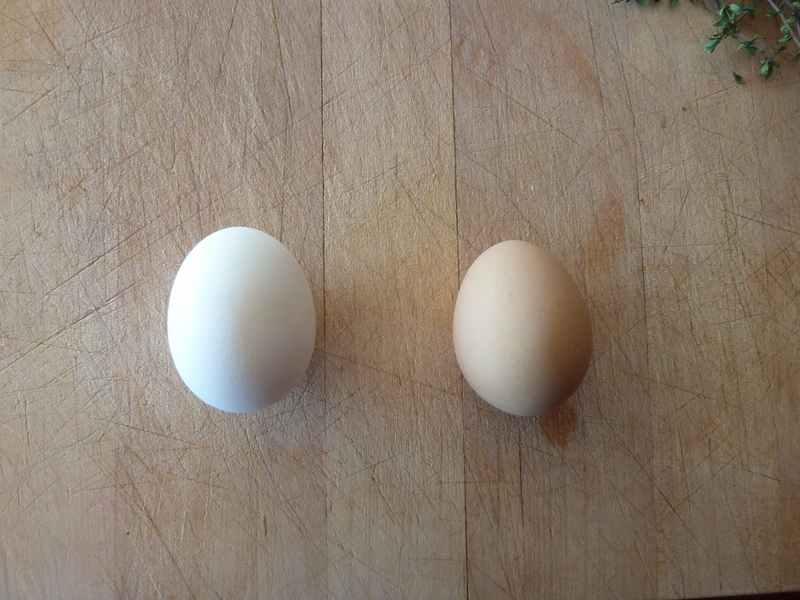 The egg on the right is a local egg and belongs to a true free-range chicken, aka LOCAL chicken. Why are local eggs better? 1. You know where they came from. 2. You are eating healthier, lower-cholesterol, natural yolks with more beta-carotene. 3. You are not supporting those sad tortured chickens in tiny cages managed by industrial farms out for a profit. 4. You reduce your risk of getting sick from those nasty commercial eggs. Finding local eggs can be difficult depending on where you live. Finding healthy local eggs is even more of a challenge. How do you know that the person who owned those chickens wasn’t feeding them genetically modified grains, antibiotic feed, or Wonder bread? You just have to ask questions, or better yet, go and see the farm for yourself. If they have nothing to hide then they shouldn’t deny you access. Most people would be happy to give you a tour if they know you are eating their chickens’ eggs and therefore supporting their existence. Finding local eggs was very easy for me when I lived in Pennsylvania. Finding local eggs is very difficult for me where I live now. You can find natural food stores but beware of industries trying to masquerade as healthy, friendly companies. There’s a market for this, people. There’s a reason that gluten-free products and Whole Foods are so expensive–because there is money to be made from people who are trying to eat better. Your local eggs should come directly from a farm (meaning YOU get them directly from the farm, not Whole Foods) or from a small local store that carries eggs from local farmers. The farmer’s name and contact information should be directly on the carton. And don’t be afraid if these cartons are mismatched or seemingly from Giant—farmers recycle donated egg boxes to save themselves from having to purchase any. Commercial eggs completely gross me out now and I don’t trust the United States Department of Agriculture to tell me what’s good and what’s not when it comes to eggs. Let’s have a look at the inside of these eggs, shall we? 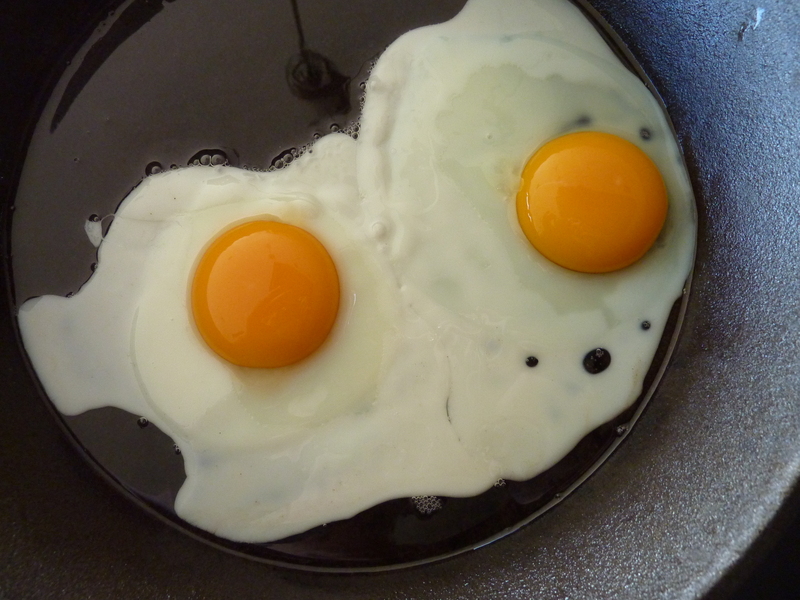 Can you see how much darker in color these yolks are? 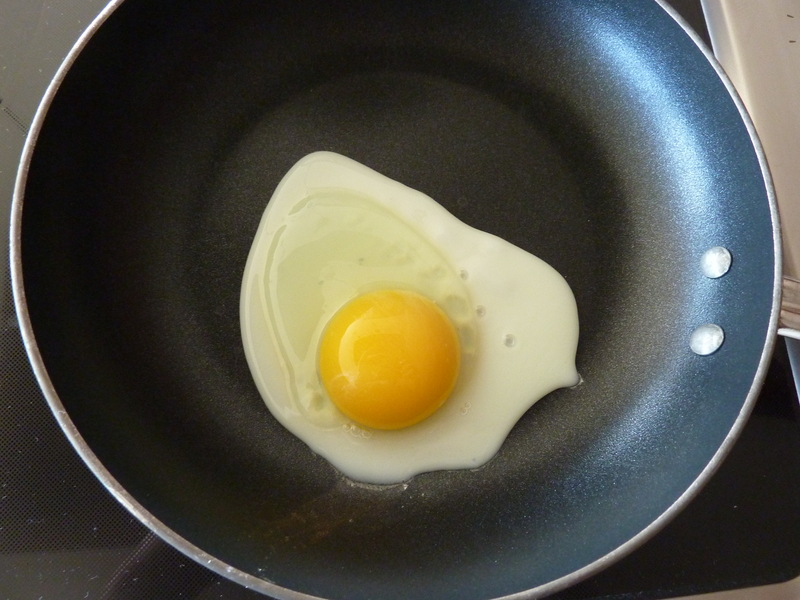 Natural, really healthy chicken yolks from local eggs are very dark orange. That’s because they are chock-full of beta-carotene and other healthy vitamins. Eww, it just runs right out of there. 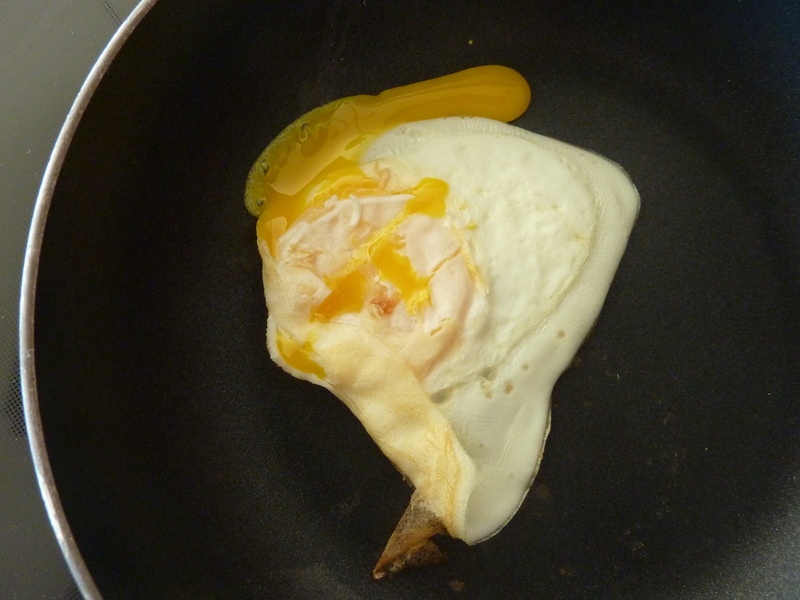 The egg’s shell is brittle, the yolk and egg white are thin and runny, and the yolk is bright yellow. Sounds like a pretty sick hen to me. No way was I putting that in my cast iron. So obviously I made two of the local eggs because they are delicious and healthy so I ate them. I am very sorry for wasting this commercial egg, I figure if the chicken went through all that suffering and sickness to provide this one egg, I should eat it right? But alas, I cannot. Do a little bit more thinking the next time you buy your eggs. Lots of unhealthy chickens depend on your purchases. You can make a difference if you stop buying! You’re one person, but so am I! Together we can influence, educate, and change. Buy local eggs!